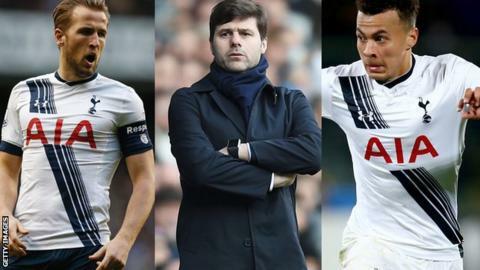 Tottenham: Are they the Premier League's forgotten fairytale? From relegation strugglers to title favourites in less than a year, Leicester's remarkable rise has been the story of the season, with many neutrals hoping they can clinch the Premier League title in May. As the team most likely to stop them, Tottenham have become the pantomime villain in the Foxes' fairytale. But with the chance to win their first league title in 55 years, Spurs' own story is as remarkable as it is impressive. Last season Tottenham finished fifth in the Premier League - 23 points behind champions Chelsea - and conceded as many goals as relegated Burnley. In less than 12 months, the north London side's improvement has been remarkable. Not only are they the top scorers in the league, but they also now have the best defence. Only in terms of taking their chances have Spurs failed to improve, despite Harry Kane having another excellent season. Ranked as sixth favourites for the title at odds of 150-1 by many bookmakers at the start of the season, Tottenham could become the first side to finish outside the top four one season and win the title the next since their arch-rivals Arsenal in 1989. Achieving that feat would see them win their first top-flight title since 1961 and only the third in their history, moving them level with the likes of Blackburn Rovers and Huddersfield Town. It is 20 years since Alan Hansen's famous claim that "you can't win anything with kids" was disproved by a title-winning Manchester United side brimming with talented youngsters such as Paul Scholes, David Beckham and Gary Neville. However, if Tottenham do win the title this season, they would outdo even that side to become the youngest champions in Premier League history. While Manchester United did have more players aged under 23 than this current Spurs side, it also had experienced veterans in their 30s such as Denis Irwin, Steve Bruce and Gary Pallister to lead them, while the oldest outfield player in Tottenham's squad this season is 28-year-old centre-back Jan Vertonghen. Although there is concern over the number of English players in the Premier League, Tottenham boss Mauricio Pochettino has placed great faith in them, with Harry Kane, Eric Dier, Kyle Walker, Dele Alli and Danny Rose heavily involved in Spurs' title challenge. Only four Premier League teams have given more minutes this season to English players than Tottenham, while the three title favourites at the start of the campaign - Manchester City, Chelsea and Arsenal - have, along with Newcastle, given the least. Pochettino's trust in English players has been to the benefit of the national team, with Rose, Dier, Alli and Kane all starting and starring in England's 3-2 win over Germany on Saturday. The understanding between Alli and Kane is actually the most prolific in Europe's top five leagues this season, with the midfielder setting up seven of the striker's goals - a fact that will please England manager Roy Hodgson heading into the summer. If the club's English players continue to play such an integral part and help them win the Premier League, Tottenham would be the champions with the most English representation since Manchester United lifted the trophy in 2001. One of the reasons why Leicester's title challenge is so remarkable is that they are outdoing the big-spending clubs of the Premier League. But while Tottenham have spent £256m on players over the past five seasons - still significantly less than the two Manchester clubs, Chelsea and Liverpool - they have sold an incredible £293m worth of talent, meaning they have actually brought in more money than they have spent in that time. Even Leicester in their two seasons back in the Premier League have a net spend of £48m compared to Tottenham's £7m. In an era in which it is often claimed that English players are too expensive, it is worth noting that Rose, Alli and Dier - all of whom started alongside academy graduate Harry Kane on Saturday in Germany - cost a combined £10m. It is well known that Leicester manager Claudio Ranieri is yet to win a major league title in his managerial career, but Tottenham's title challenge is being led by a man who is yet to win a trophy of any kind as a manager. Ranieri has experience of winning the Coppa Italia with Fiorentina and the Copa del Rey with Valencia. However, Tottenham boss Pochettino would become the first manager for whom the Premier League trophy would be his first silverware if Spurs were to be successful in May. In any other Premier League season, a club going from title outsiders to title challengers by shrewdly assembling a squad of young players with a strong English core under a manager yet to win a trophy would be the story of the season. That it is not makes Tottenham the Cristiano Ronaldo of this season's Premier League - a fantastic story in their own right, but just unfortunate that an arguably even better one is taking place at the same time. Leicester's story is undoubtedly incredible, but Tottenham lifting the trophy in May would arguably also be the most remarkable title win in Premier League history.